“Sustainability” has become an important topic these days. Clearly defining the term, however, can be elusive. At Hilleberg, we think more in terms of “responsibility,” and, more specifically, we follow our own Responsibility Code: 1) We are responsible for making the highest quality tents that do what they’re supposed to do, with no compromise. 2) We are equally responsible for using materials and practices that make as little negative impact on the world around us as possible in the process. 3) We are responsible for constantly reviewing the balance between 1 and 2, and for always working towards both greater function and less negative impact. At its heart, our Code comes from what we have always believed about integrating nature and the outdoor life with everyday life. Years ago, Bo Hilleberg wrote, “I do know that an outdoor life’s simplicity is what is most compelling: while it is – and always has been – a revelation to me to arrive at a beautiful place and camp, it has always been at least as important to leave that spot the next day looking as though I’d never been there.” These concepts of simplicity, engagement, and leaving as little an impact as possible on one’s surroundings transfers directly to how we run our company, and they have been guiding us since Hilleberg’s inception over 45 years ago. To this end, we strive to make the most functional yet simplest to use products we can; to build them so they last a long time; to make sure that they work well for what they are designed to do; and to have the capability to repair our tents when necessary. We choose materials that will fulfill our standards without compromise, but whose production has as little harmful effect as possible. We endeavor to foster long-term relationships, built on integrity, with our suppliers, our retailers, and our customers. We ensure that all those who work for us have clean, safe working conditions, and are treated fairly and with respect. And we talk honestly about our products and how to use them. Underlying our responsibility ethos is our purposeful choice to keep our company comparatively small and family-led. We are certainly not averse to growth, but we choose to manage it so that we can maintain the high quality of our products, of the work environment for our workers, and of our relationships with everyone we work with. These have always come first, and by keeping our company small, we can stay true to what we believe, work cleanly with our Responsibility Code, and be, in the truest sense of the word, sustainable. 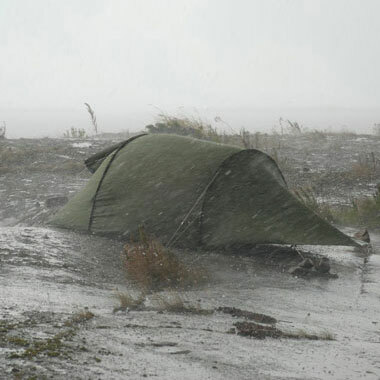 We build our tents both to handle tough conditions, and to have a long lifespan. Here a 30 year old Nammatj stands strong against some truly ugly conditions. Photo: Anders Gustafsson. Twenty years ago, we moved our production out of Sweden, but we deliberately chose to stay in Europe. We wanted a long-term solution, so we created our own facility in Rapla, Estonia, and we built relationships with carefully vetted contract factories nearby. This has allowed us both to get the exact quality we want, and to quickly make any changes needed to get it. Estonia is only a short plane ride away from our Swedish headquarters, and less travel equals less impact. In addition, the proximity affords better communication, and allows us to work with remarkable efficiency. Also important is that Estonia’s laws and ethics are very similar to Sweden’s, so we can ensure that both our facility and those of our contractors have the same standards for working conditions that we have always embraced. As a result, many of our Estonian workers have been with us for since we opened the factory. 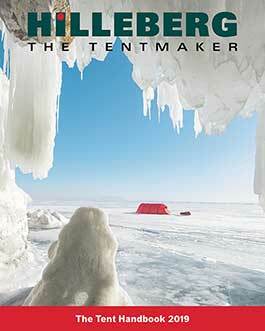 In fact, over his 19 years with us, one of our tent inspectors has set up at least 65,000 tents. For all materials, we comply with the European Union’s European Chemicals Agency regulation for “Registration, Evaluation, Authorization and Restriction of Chemicals,” or REACH. In all of our contracts with our suppliers, we require that they not use any chemicals restricted by the ECHA, and we strive to ensure that we do not use harmful materials anywhere in our supply chain. Even more importantly, we choose material suppliers whom we know can work within our requirements and that fit into our Responsibility Code. Our pole supplier, DAC, is a good example. The most environmentally harmful part of aluminum tent pole production is the anodizing process, which historically has used highly toxic nitric and phosphoric acids. DAC spent many years perfecting their Green Anodizing process, which eliminates both chemicals. They have designed and built their own equipment to keep their process as clean as possible, and they pride themselves on far exceeding any governmental requirements. They have also incorporated a “Green Atmosphere” into their facilities, complete with dedicated green space and water features, built to inspire people to think more about the natural world and their place in it. Essential to our responsibility ethos are the long term relationships we build in all parts of our business. We have worked with DAC poles for 17 years, and we are close friends with Jake Lah, the founder and owner. We have also worked with our main fabric supplier for at least as long, and with whom we have a similarly close relationship. With all our suppliers, we are in constant communication, and we push each other to be better in both function and processes. The resulting relationships, built over time on both loyalty and trust, allow each side to achieve more, to do so in a positive way, and with less negative impact on the world around us. We firmly believe that our customers are our greatest asset. While many of our customers are true professionals, who do expeditions and exploring for their livelihood, most are simply people who love to be outdoors. All have purposefully chosen our tents, so all are a part of “Hilleberg.” We prioritize customer service, which, for us, means having customer relationships, preferably long term ones. A big piece of that is our repair capability. From full repairs to fixing minor damage, we have both in-house repair craftsmen as well as a network of Hilleberg-trained repair contractors. We often hear from long-term customers who simply want their vintage but still fully functional Hilleberg tent (some are 30 years old) revitalized. This service not only reduces impact on the environment, but it also fosters the climate of mutual trust, respect, and loyalty that we strive for in all our relationships. For nearly 20 years, we have worked together closely with DAC, who makes our poles. During that time, we have become close friends as well as close business partners. 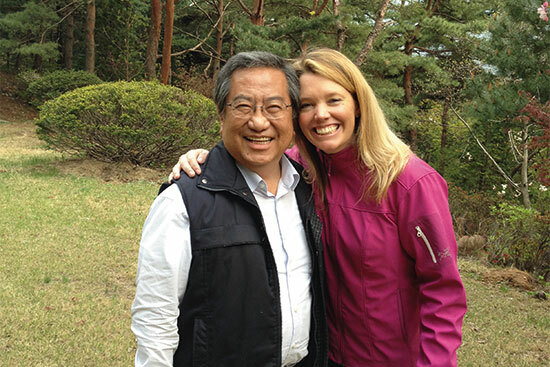 Here Petra Hilleberg and Jake Lah, DAC’s founder, take a moment during a recent visit to South Korea. We have built a very strong relationship with Mid Sweden University, in Östersund, only a few minutes away from our offices in Frösön. We can test fabrics and other materials, and work with material scientists. 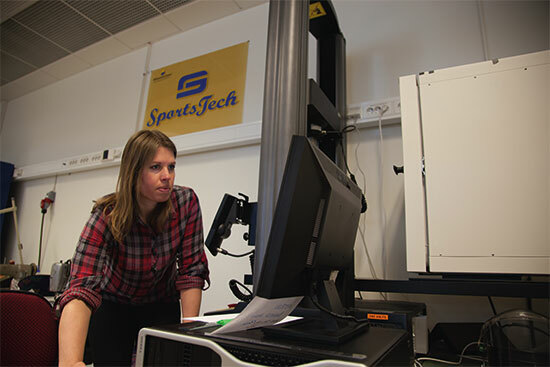 Here Hilleberg’s Lisa Nilsson is using the tear strength testing system at the University’s SportsTech lab.